Eurograde 0 - Cash rating €6,000 or valuables rating €60,000. VdS high security electronic lock with up to 10 user codes powered by 3 x AA batteries (included). Biometric Fingerprint lock using fingerscan. Adjustable depth up to 355mm externally and 295mm internally. Tested & supervised by VDS/ECBS according to EN 1143-1. The Biosec 6000 Wall Safe Series includes two models secured by an electronic combination lock and a fingerprint swipe lock. 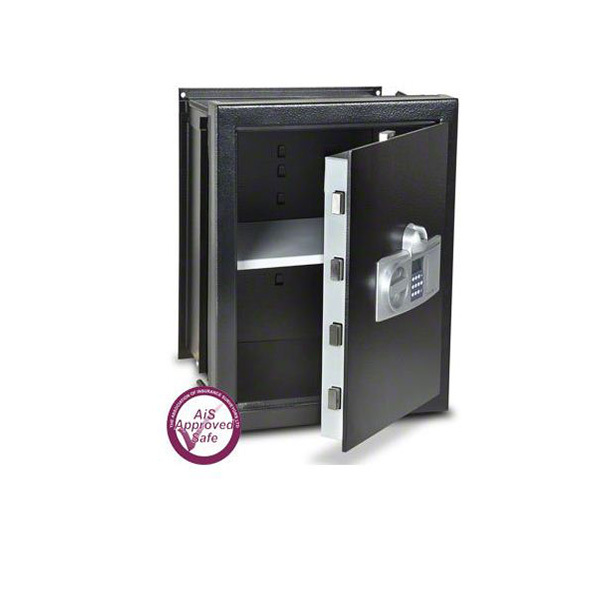 Recommended for business and domestic cash risks this modern safe includes adjustable depth allowing for easy installation. For additional security the safe is fitted with 3-way moving bolt work and should installed within a wall. * Ratings are approximate and may vary due to conditions and location. Please check with your underwriter.